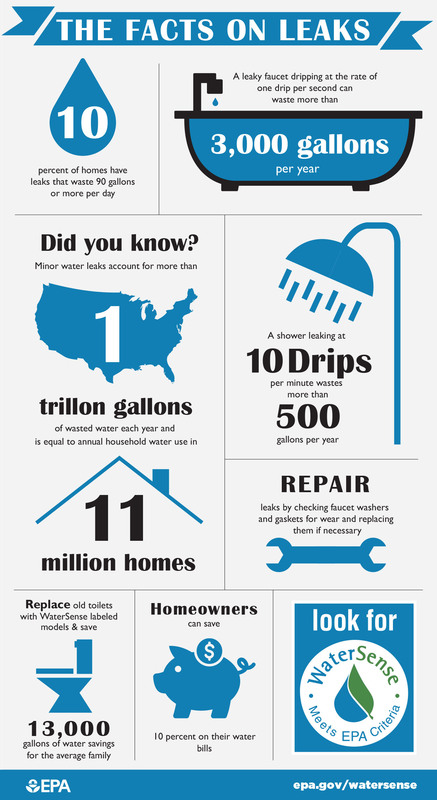 More than one trillion gallons of water from easy-to-fix leaks are wasted in U.S. homes each year. That’s why the City of College Station is joining with the U.S. Environmental Protection Agency to encourage you to find and fix leaks during this week’s annual Fix a Leak Week. Sponsored by the EPA’s WaterSense program, Fix a Leak Week can help you improve the water efficiency of your home by finding and repairing leaks. In an average home, leaks waste more than 10,000 gallons of water annually – enough to wash 270 loads of laundry. That makes for a hefty water bill, too. Check your water bill and water meter for signs of leaks. If winter water use exceeds 12,000 gallons per month for a family of four, you probably have leaks. Read your water meter before and after a two-hour period when no water is being used. If the meter changes at all, you probably have a leak. Water meters also have a leak indicator. If there is a plus (+) sign on your digital water meter, or if a red dial is moving — even slowly — when water isn’t being used, that’s a sign of a leak. Look for dripping faucets, showerheads, sprinklers, and other fixtures. Silent toilet leaks, a common problem that can send water bills soaring, can be detected by placing a few drops of food coloring into the toilet tank and waiting 10 minutes before flushing. If any color appears in the bowl during that time, you have a leak. Don’t forget to check irrigation systems and spigots too. Apply pipe tape to ensure plumbing fixture connections are sealed tight and give leaking faucets and showerheads a firm twist with a wrench. If you can’t stop the drips yourself, contact a licensed plumber. For additional savings, twist a WaterSense labeled aerator onto each bathroom faucet to save water without noticing a difference in flow. Faucet aerators cost a few dollars or less and can save a household more than 500 gallons each year — enough for 180 showers. If you just can’t nip that drip, it may be time to replace your fixture. WaterSense-labeled models use at least 20 percent less water and are independently certified to perform as well or better than standard plumbing fixtures. Replacing an old, inefficient showerhead with a WaterSense-labeled model will shrink your household’s water footprint by 2,900 gallons annually while still letting you shower with power, thanks to EPA’s efficiency and performance criteria. With less hot water passing through, WaterSense labeled showerheads can also save enough energy to power your television for a year. Replace your old toilet using 3½ gallons per flush or more with a WaterSense-labeled toilet, and you could be eligible for a rebate of up to $100. Grab a wrench this week or contact your favorite handy person, plumber, or licensed irrigator to address leaking toilets, faucets, showerheads, and irrigation systems around your home. If you find and fix a leak, take a picture (a leaky selfie?) and share it on Twitter (#ifixleaks). For more information on how to save water, go to cstx.gov/water or contact me at jnations@cstx.gov. This entry was posted on March 19, 2018 by City of College Station. It was filed under Public Communications, Water Services and was tagged with Fix a Leak Week, water conservation.